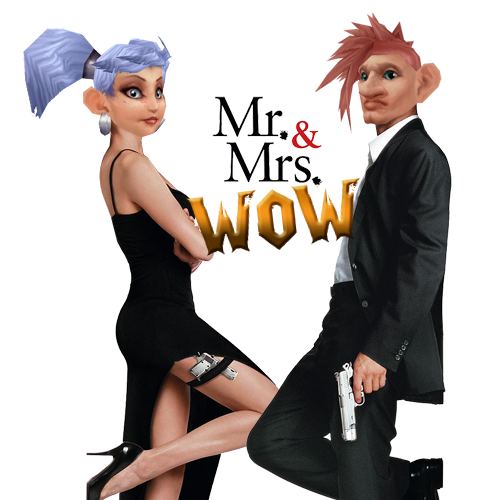 Disclaimer: this is my own noobish adventure, I am by no means an expert! I have provided the team I used, plus a bit of info. I hope it helps! Crimson (Dragonkin) – Rampana Whelk. This guy does a cyclone which can cause a lot of damage to your back row pets. I took some with self-heals to counter this. Otherwise, the snail got him down fine with poison and burrow. 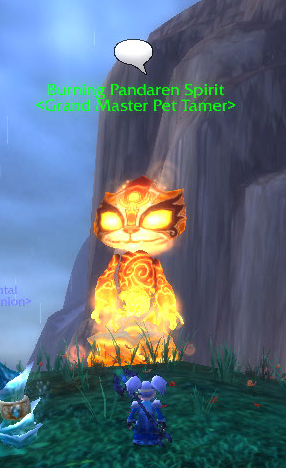 Pandaren Fire Spirit (Elemental, a mini-me) – Rampana Whelk. I got lucky as my burrow crit hit this guy and one-shot him. However, I’ve done it before without critting and the snail manages fine with burrow, which is strong against him. Glowy (Flying) – Nether Faerie Dragon. This was a close call. I used Moonfire, which is a strong attack, plus slicing wind. I could have swapped in the Whelpling, but I just managed to get him down without. 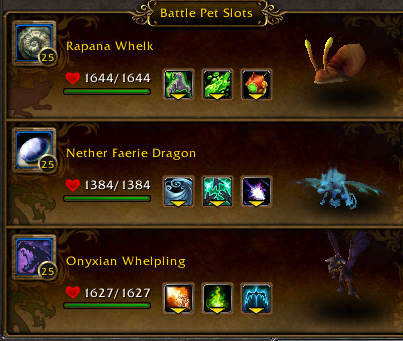 Pandaren Earth Spirit (Elemental) – Rampana Whelk. The spirit’s first move is a stun, but causes no damage to the snail so it was an obvious one to use. I then put a poison on for ticking damage and with one burrow, it’s dead. Without the poison, it causes a lot of damage with other attacks which ultimately, wipes me out. Sludgy (Critter) – Clockwork Gnome. It took me a while to figure this out as it was taking out 2 pets with its really heavy attacks – eventually I realised the using the Gnome means the big attacks are weak against it and I stayed alive long enough to fire a couple of rockets off which decimated it. The Gnome was finished off in the process though. Darnak the Tunneler (Beast) – Whelpling. This beast is a nightmare! He has some large attacks which cause issues. 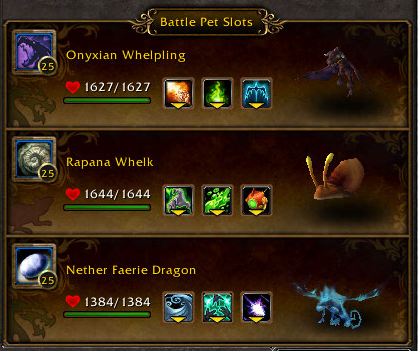 However, with the Whelpling’s self-heal and lift off, it was fine after I timed each one correctly. It’s interesting to note he always starts by putting the Stoneskin buff on, which gives you time to buff or heal yourself. 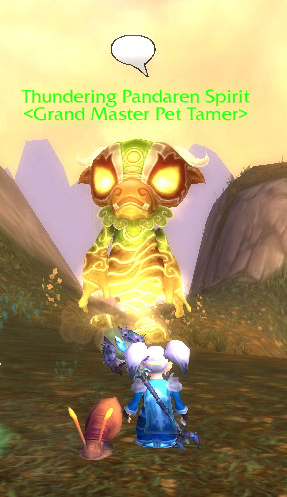 This was by far the hardest tamer, in my opinion! Marley (Aquatic) – Nether Faerie Dragon. I started with Moonfire which is strong against this guy. He opened with whirlpool, so I knew I had 3 rounds to either swap or Life Exchange. I did neither, but still managed to finish him off before he got me. Tiptoe (Critter) – Rampana Whelk. This was fine with poison and burrow like normal, no problems and had half his life left at the end. 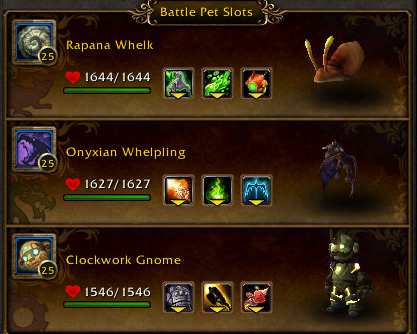 Pandaren Water Spirit – Rampana Whelk / Whelpling. The snail managed to get half his health off using burrow, before the Geyser and Whirlpool abilities wiped him out. The Whelpling finished him off fine, healing through the moderate Tidal Wave abilities. Dusty (Critter) – Nether Faerie Dragon. Using Moonfire as an opener, then Slicing Wind til dead worked ok. He does some horrid attacks which can be devastating, but I used Life Exchange which helped a lot. Whispertail (Dragonkin) – Whelpling: I started with the Glowfly, but he pretty much one-shot it. I got lucky with the whelpling, as I used Lift Off and it crit, so he went down in two moves. The Tail Whip and Wild Winds ability are pretty powerful. 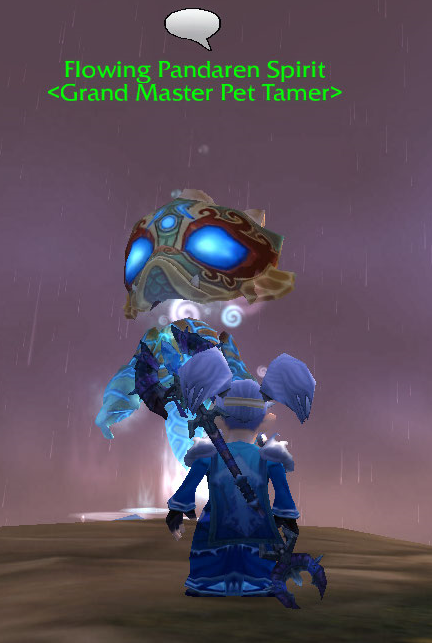 Pandaren Air Spirit (Elemental) – Whelpling. This was easy with heals and Lift Off. No problems. It took me a couple of tries to find which method of abilities was best for each. 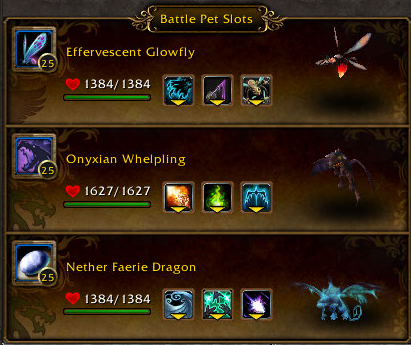 I have a lot of 25 pets, but as you can see, I have a few favourites which really work well for me. Good luck with the Spirit Tamers, let me know how you get on!